Our book store holds a collection of genealogy books, cemetery monument inscriptions, church registers, and Quebec Crown land grants records to help you with your research. These books and order forms are organized by topic. Print the appropriate order form(s) and mail with your cheque to QFHS. All prices are in Canadian dollars. Shipping and handling (S&H) costs are listed on the order forms. For shipping and handling costs for orders to destinations other than Canada and the US, please contact our Book Store manager at qfhs.booksales@bellnet.ca. Likewise, if you are buying more than one item, shipping can be combined. Contact the Book Store manager as above to inquire before ordering. 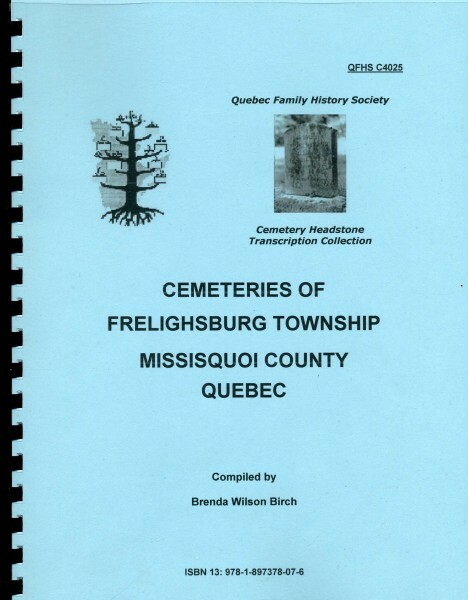 Many of the church register transcriptions, marriage indexes, cemetery monument inscriptions, census transcriptions, and QFHS publications listed below are available in an 8.5" x 11", comb (spiral) binding format, unless otherwise indicated. All books in this series measure 8.5 x 11 with comb bindings, unless otherwise indicated. Editor: Robert Dunn - 254 pp. Editor: Marlene Simmons - 290 pp. Editor: Shirley Lancaster - 30 pp. Editors: Miriam Hayward and Shirley Lancaster - 80 pp. Editor: Randy D. McConnell - 124 pp. 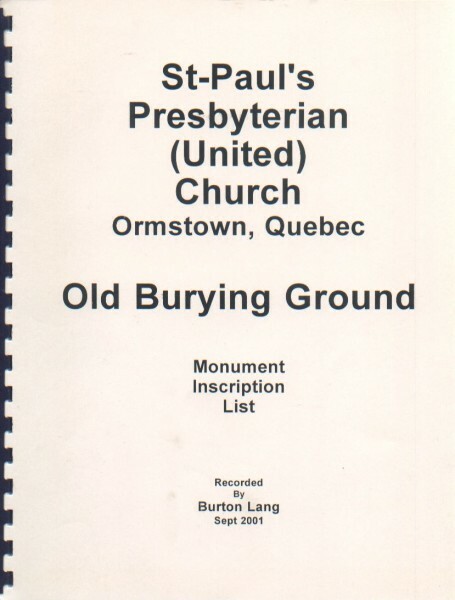 This transcription has been compiled from the original parish registers of Quyon United Church of Onslow Township, Pontiac County, Quebec. It is a register of births and baptisms, marriages and burials, from 1859 to 1930. Unknown Now available in cd format only. Editor: Kathleen Brock - 8.5 x 14 comb binding; 60 pp. Editor: Kathleen Brock - 92 pp. Editor: Kathleen Brock - 8.5 x 14 comb binding; 58 pp. Editor: Marlene Simmons - 316 pp. Editors: Sheila Hennessy and Robert Dunn - 545 pp. Editor: Anne-Marie Garneau - 200 pp. All of the books in this category measure 8.5 x 11 with comb bindings. Editor: QFHS - These indexes are a series of lists of settlers granted land lots and refers to the page where their properties are shown in the publication "Lands Granted by the Crown in the Province of Quebec from 1763 to 31st December 1890." For information on the Land Grants research process, visit Quebec Land Grants in the Library section. Author: Lucille H. Campey - softcover, 208 pp. The days when Aberdeen's "fast sailing and copper-bottomed" ships carried emigrant Scots to Canada are brought to life in this fascinating account of the northern Scotland exodus during the sailing ship era. Lucille H. Campey finds convincing evidence of good ships, sailed by experienced captains and managed by reputable people, thus challenging head on the perceived imagery of abominable sea passages in leaking old tubs. Campey's approach is to identify all of the emigrant sea crossings to Canada made on Aberdeen sailing ships. Natural Heritage Books, 2002. Author: Maureen Borland - hardcover, 291 pp. Author: Matthew Farfan - softcover, 52 pp. Farfan's handbook, a how-to manual for those interested in conserving and restoring cemeteries, covers topics such as: legalities related to cemeteries in Quebec, fundraising and recruiting volunteers, and maintenance of gravestones. Quebec Anglophone Heritage Network, 2008. Author: Barbara Young - softcover, 133 pp. "It started so innocently. At first all I wanted were her parents' names for the family tree." Authors: Donna Templeton and Jean Furcall - softcover, 197 pp. Authors: Donna Templeton and Jean Furcall - softcover, 285 pp. Author: Lois L. Stephenson - soft cover, 80pp. St. Henry, created in 1831, in the seigneury of Rigaud was settled largely by families from Cumberland, England. This book recounts the history and tells stories about life in the now vanished settlement. Hudson Historical Society. 1994, second printing. Authors: Rod L. Hodgson, Margaret A. Peyton, Daniel VIgneault and Martin Hofton - softcover, 179 pp. Author: Robert Sellar - hardcover, 644 pp. Author: John Thompson - softcover, 104 pp. Authors: W.L. Gardiner and Trisha Santa – softcover, coil binding, 84 pp. Belfast, Prince Edward Island, founded in August 1803, owes its existence to Lord Selkirk. Selkirk's work in Canada extended beyond Belfast to Baldoon (later Wallaceburg) in Ontario, as well as to Red River, the precursor to Winnipeg. Authors: Rod L. Hodgson and Martin R. Hofton - softcover, 217 pp. A collection of four short histories of the Hudson Fire Department, the C.P.R. rail line from Montreal through Hudson to Rigaud, Ice Harvesting on the Ottawa River (1906-1960) and the explosion at the Curtis & Harvey Munitions plant in Dragon in 1917. Hudson Historical Society, 3rd edtition, 2009. Author: Sharon Callaghan - softcover, 136 pp. Author: Lucille H. Campey - softcover, 312 pp. Author: Lucille Campey - softcover, 224 pp. Author: Lucille H. Campey - softcover, 184 pp. Author: United Empire Loyalists Association of Canada - softcover, 485 pp. Author: Rod L. Hodgson - softcover, 34 pp. Thomas Bassett Macaulay was an insurance executive (Sun Life Assurance) and gentleman farmer. Descendants of his herd of Holsteins can be found throughout the world. Hudson Historical Society, 1997. Author: Anthony Adolph - softcover, 224 pp. Editors: Robert Dunn and Derek Hopkins - 32 pp. Transcriptions from Church Registers for Marriages at Ascension Anglican Montreal (Outremont) Church, from 1898 to 1925. 1,044 marriages recorded. Editors: Robert Dunn and Derek Hopkins - 38 pp. Transcriptions from Church Registers for Marriages at Garrison Anglican Church, Montreal, from 1790 to 1880. 1,104 marriages recorded. Editors: Robert Dunn and Derek Hopkins - 80 pp. Transcriptions from Church Registers for Marriages at Grace Anglican Church, Montreal (Pointe-Saint-Charles), from 1868 to 1925. 2,676 marriages recorded. Editors: Robert Dunn and Derek Hopkins - 150 pp. 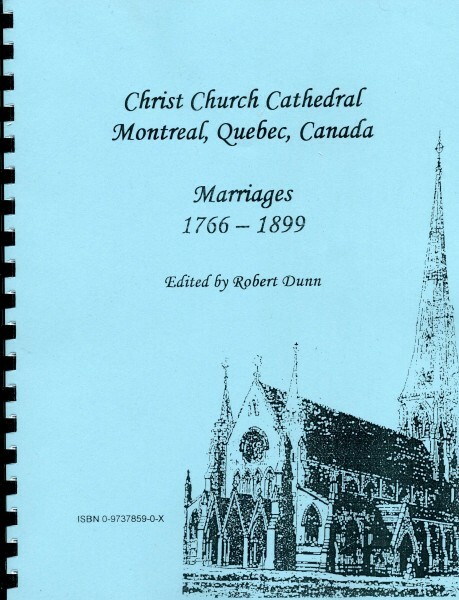 Transcriptions from Church Registers for Marriages at Saint George Anglican Church, Montreal, from 1817 to 1925. 7,152 marriages recorded. Editors: Robert Dunn and Derek Hopkins - 36 pp. Transcriptions from Church Registers for Marriages at All Saints Anglican Church, Montreal, from 1890 to1925. 1,414 marriages recorded. Editors: Robert Dunn and Derek Hopkins - 16 pp. Transcriptions from Church Registers for Marriages at Christian Advent Anglican Church, Montreal, from 1894 to1925. 314 marriages recorded. Editors: Robert Dunn and Derek Hopkins - 40 pp. Transcriptions from Church Registers for Marriages at Calvary Congregational Church, Montreal, from 1834 to 1920. 1,448 marriages recorded. Editors: Robert Dunn and Derek Hopkins - 100 pp. Transcriptions from Church Registers for Marriages at Saint James Methodist Church, Montreal, from 1818 to 1925. 4,708 marriages recorded. Editors: Robert Dunn and Derek Hopkins - 74 pp. Transcriptions from Church Registers. for Marriages at American Presbyterian Church, Montreal, from 1832-1925. 2,588 marriages recorded. Editors: Robert Dunn and Derek Hopkins - 92 pp. 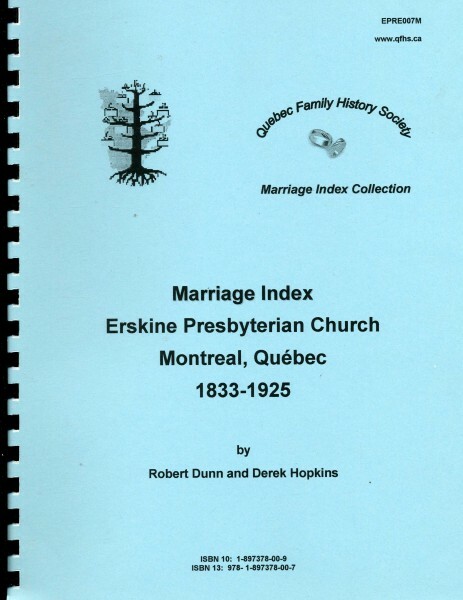 Transcriptions from Church Registers for Marriages at Erskine Presbyterian Church, Montreal, from 1833 to 1925. 4,188 marriages recorded. Editors: Robert Dunn and Derek Hopkins - 88 pp. Transcriptions from Church Registers for Marriages at Saint Andrew's Presbyterian Church, Montreal, from 1815 to 1925. 3,944 marriages recorded. Editors: Robert Dunn and Derek Hopkins - 154 pp. Transcriptions from Church Registers for Marriages at Saint Gabriel's Presbyterian Church and First Church, Montreal, from 1778 to 1925. 2,962 marriages recorded. Editors: Robert Dunn and Derek Hopkins - 22 pp. Transcriptions from Church Registers for Marriages at Saint Andrew's Presbyterian Church, Lachine, from 1818 to 1925. 646 marriages recorded. All books in this series measure 8.5 x 11 with comb bindings unless otherwise indicated. Editor: QFHS - 49 pp. Editor: Burton Lang - comb binding, 60 pp. Editor: Shirley Lancaster - 40 pp. Editor: Brenda Wilson Birch - 120 pp. Editor: Brenda Wilson Birch - 196 pp. Editor: Brenda Wilson Birch - comb binding, 100 pp. The Greenwood Cemetery is located at the corner of County roads 10 and 11 in West Hawkesbury township, Prescott, Ontario. Known as Griffin Burying Ground prior to 1923, it was established in 1841. Editor: Carol Martin - 208 pp. Author: Brenda Dawn Wilson - Coil binding, 100 pp. 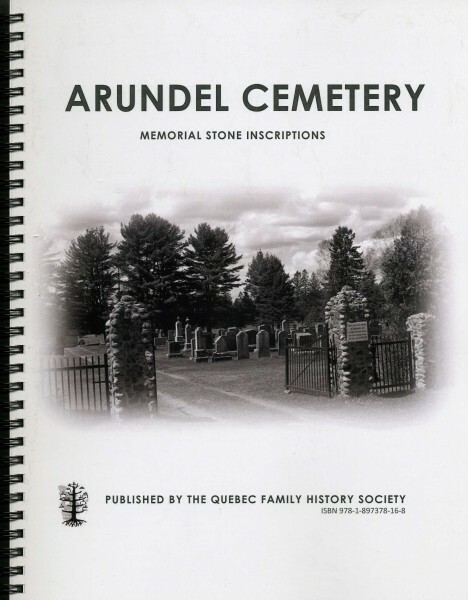 The two cemeteries included in this book are: Knowlton Protestant Cemetery (also know as Wheeler Cemetery) and St. Edouard Catholic Church Cemetery. Lachute Protestant Cemetery is one of the oldest non-Catholic cemeteries outside of metropolitan Montreal. 1,984 monument inscriptions were recorded. Editors: Gordon A. Morley and William J. Park - ? pp. Editor: QFHS - 40 pp. Editor: QFHS - 108 pp. Editor: Marlene Simmons - 254 pp. Editor: QFHS - 10 pp. Editor: Raymond Woods - 118 pp. Editor: Brenda Wilson Birch - 96 pp. Editor: Burton Lang - 12 pp. Editor: Burton Lang - 17 pp. Editor: Brenda Wilson Birch - 161 pp. Editor: Brenda Wilson Birch - 193 pp. Editor: Marlene Simmons - 306 pp. Authors: Boyd, Green-Guenette, Larrabee - 8.5 x 11 comb binding, 106 pp. Lovell’s 1908 Gazetteer of the Dominion of Canada. This CD has been scanned from the original book, in fragile condition, in the QFHS library and is searchable. This CD is a valuable addition to those researching early 20th century places in Canada. This item is sold as .pdf file on CD. Editor: Marlene Simmons - comb binding, 213 pp. Editor: Burton Lang - comb binding, 150 pp. Editor: QFHS - comb binding, 102 pp. For those of you who were unable to attend Roots 2015, the International Conference on Family History held at McGill University on June 19-21, 2015, the Roots 2015 Syllabus containing the lecture notes from the 18 Presentations at the conference is now available. All books in this series measure 8.5 x 11 with comb bindings. Clearance Sale on all paper copies of 1851 Census Transcription books while quantities last. Editor: QFHS - 172 pp. This book contains information of the almost 4,000 individuals who lived in the Township of Hemmingford at the time of the 1851 census. The information in this book was transcribed from the Library and Archives Canada microfilm reel C-1112. 1992 Was $14.00. Editor: QFHS - 32 pp. This book contains information about the almost 700 individuals who lived in the village of Huntingdon at the time of the 1851 census. The information in this book was transcribed from the Library and Archives Canada microfilm reel C-1111. 1992 Was $7.00. Editor: QFHS - 170 pp. Editor: QFHS - 70 pp. Editor: QFHS - 96 pp. If no "Add to Cart" button is available, cost of shipping will be determined at time of purchase. Author: Samuel Chamberlain - Hardcover, 619 pp. Recipes from the from the best provincial and Parisian chefs are translated and adapted by Narcissa Chamberlain. This book is a Gastronomic Guide to the French Provinces in the 1950s. Superb black and white photographs and illustrations record the French countryside and the beauty of the architecture which survived WWII. Commissioned by Gourmet Magazine, the Chamberlains compiled a wonderful book about France that is a guidebook, restaurant directory and cookbook in one. Gourmet Distributing Corporation, New York, 1952. Author: Elsie MacMillan - Hardcover. 371 pp. Good condition. In addition to a general history of the area, Elsie MacMillan tells stories of the families who settled what was initially the 14th concession of Lancaster Township, Glengarry County. In 1818, the 14th became the 5th concession of Lochiel Township. The properties follow what is now Lochiel Road from Highway 34 at Fassifern eastward to Lorne where it splits to go along Brodie Road on the north side and Glen Sandfield Road on the south side until the border of Lochiel twp. Included are genealogies, many photos of the people and places of the district, stories of businesses, churches, schools and a name index. Elsie MacMillan, et al., Dalkeith, Ontario, 1982. Hebrew University of Jerusalem - Hardcover. Very good condition. "Family Who's Who" records the genealogy of any family who gave a minimum endowment of $1,000 to support the Hebrew University of Jerusalem. Although most families were living in Canada, many American Jews and some Australian, Argentinian, and other nationalities have contributed summaries of their family histories for posterity. It is arranged alphabetically with an index to Hebrew and Yiddish names at the back. Wallace Press Limited, Montreal, 1969. Hebrew University of Jerusalem - Hardcover. 571 pp. Good condition. This edition of "Family Who's Who" contains much of the same information as the first edition with updates to some family trees. Mostly Canadian families with reference to a small number of international families who gave endowments to the Hebrew University of Jerusalem. Graphic Enterprises Inc, Montreal, 1976. Author: Ronald Edward Zupko. - Hardcover. 208 pp. Equivalent US and UK dimensions are given for about 2,500 different units of measure with regional and local variations from the time of Charlemagne to the French revolution. Indiana University Press, Bloomington and London, 1978.
from Lake Superior to the Pacific (1659-1895) Volumes 1 and 2. Author: Rev. A.G. Morice, O.M.I. - Hardcover with Maps and Illustrations. Vol. 1, 351 pp. ; Vol. 2, 414 pp. Previously held in library. Has library stamps, etc. Sold as a set. From the Preface: "The history of the Catholic Church in Western Canada is the history of deeds of heroism, devotion to duty under the most untoward circumstances, stirring adventures and hair-breadth escapes scarcely paralleled in modern times. (...) missionaries bade farewell to home and friends, and buried themselves in the snows of the North, the sombre forests of the Far West and the wind-swept prairies of the Centre or Middle West, leading there a life of sacrifice unknown to most men, but precious in the eyes of God." Musson Book Co., Toronto, 1910. Author: Prosper and Marceline Assouline.com - Hardcover, 280 pp. New condition. Author: Helen Bourne Joy Lee. Pequot Press, 1975.